Description: The USA's Chief Data Scientist designated his own profession "the sexiest job of the 21st century." Here's proof he was right. Watch the origin story of Dr. Data, who performs a catchy infotainment rap about predictive analytics and reveals the power of embracing your true inner geek. and predicts if you will click, buy, lie, or die. It ain't astrological - it's math, it's methodological. So better pay attention cause my flow is pedagogical. International cities camerawork by: Maria Callou, Chrissy Curran, John Fitch, Efthalia Papacosta, Carol Robins, Fiona Robins, Jason Rajasinghe, Lisa Schamberg, and Gabriella Stromhielm. Nerds who become geeks and dance: Maria Callou, Erin Cowan, Charlene Dipaola, Rachel Elias, Nicolas Frantela, Omar Njie, Mikaela Runyan, Elinor Shapiro, Danica Siegel, Karen Zumsteg. Shot on location in Los Angeles, South Africa, Antarctica, Singapore, Burning Man (Nevada), Hawaii, Sri Lanka, New York City, Rome, and Athens. Special thanks also to Dean Abbott, Angela Robins, John Elder, Matthew Finlay, Adam Kahn, Ene Piirak, Lisa Schamberg, and Andrew Siegel. 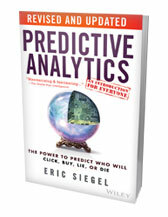 A Prediction Impact, Inc. video. Here's a little song about predictive analytics. If you wanna learn, you gotta listen to the lyrics. Listen to it twice; maybe you can memorize it. It goes a little somethin' like this. and I'll apply the computation. People don't dig data - "Boring! "'s the sentiment. Crapped out by technology - electronic excrement. and deep inside the data is the key, see. that's why every old dog needs a brand new trick. 'cause you would predict anything that moves. data scientists are the sexiest geeks! The method is to modify your model incrementally. Tweak the technique, geek, improving it incessantly. The model is trained; machine learning is attained. Make it rain... pop the Champagne! If it fails, the model bit it; simply put, it overfit it. Take a minute... flip your bits and quit it.